I have no idea if this story is actually true or if it’s a fantastical story created during a time when Boston was at its most activist. The moral still rings true: there are no worthless people; there are only people willing to treat others like they are worthless because it’s convenient. One doesn’t have to be rich think ill of someone in differing circumstances than their own. We’ve all done it and we should all make the conscious, continuous effort to stop. Class warfare is real. Like any city or town in any state in the US, Boston still has a large population of displaced individuals. Most of them are just like you and me. They are people trying to live, heal and grow as best they can with the lot life has given them. They are people trying to live, heal and grow as best they can with the lot life has given them. 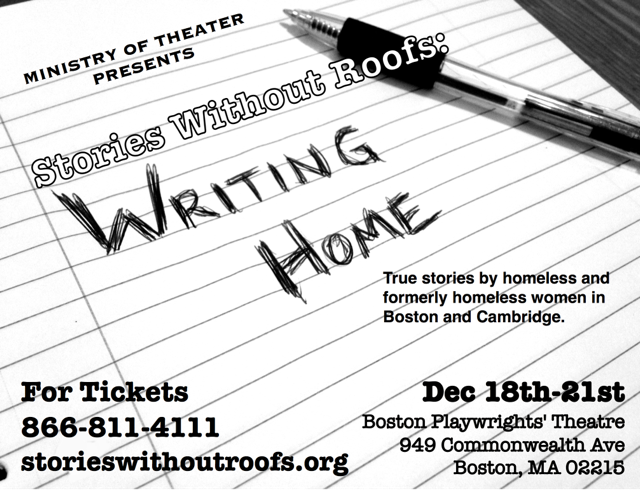 Stories Without Roofs: Writing Home tells their stories. As told through poetry, dance, song and prose, Writing Home is a compilation of stories in six movements of women who have experienced homelessness and the despair, joys, hopes, invisibility and insights that come with the experience. They are strong and vulnerable, sincere and insightful. They have gone to college, raised families, read the right books and said the right things and still they became homeless. Video clips from the authors reading their own works are featured between several movements. These writers tell us that their story could be our story. There is a talk back featuring the writers and the cast after the performance. The actors Kathleen Burke, Megan Dilworth, Aaluk Edwardson, Jasmine Rush, and Marjorie Tatum give sincere performances. Were I to find fault, it would be in their execution rather than characterization. It is the responsibility of the actor to deliver an objective performance as free as is possible from personal bias. There were moments when the deeply felt sympathy of the actors collided with the material they were presenting. Scenery was subtly chewed. While it didn’t detract from the production, it interrupt the pacing and caused the audience to disconnect. This production is a pleasantly painful experience. There are funny vignettes but most of the production relays the realities of homelessness in raw detail. The writing keeps focus on the experiences of being homeless and not the happy endings the media likes to package into pretty packages for Christmas. These are not Disney stories of penniless lasses who bloom into wealthy princesses of the realm. These are women who have been failed by the system and society and lived to tell the tale. It is important that audience members remember that this is not an opportunity to navel gaze. This production should inspire the viewer to treat the Homeless with kindness, understanding, and most of all, respect. They are people. They deserve the benefit of the doubt and a sounding board for their woes. We must remember that this production is not about us. It is about them. The most important job for an ally is to listen and then act in ways to improve the lives of the displaced. If you want to help then help in the ways that the afflicted prefer. If you’d like to help, more information can be found through On The Rise. More Than Words is an excellent program that works with kids in the foster care system. Both are nonprofits and welcome donations of many types. This entry was posted in Drama and tagged 2014, Aaluk Edwardson, Alexandria Victoria Wong, Angelica Potter, Boston, boston playrights theatre, Christnas, Dance, Denice Lowery, Dewey Square, Donna Daley, homelessness, Jasmine Rush, Jes Ryan, Kathleen Burke, MA, Marissa Wahkuna, Marjorie Tatum, Megan Dilworth, Misch Whitaker, More Than Words, Occupy Boston, Odelle Weaver, On The Rise, poetry, Pris Olivia, prose, Renee Luv, Shorty, song, Stories Without Roofs: Writing Home, the Homeless, Veronica Pruitt by Kitty Drexel. Bookmark the permalink.